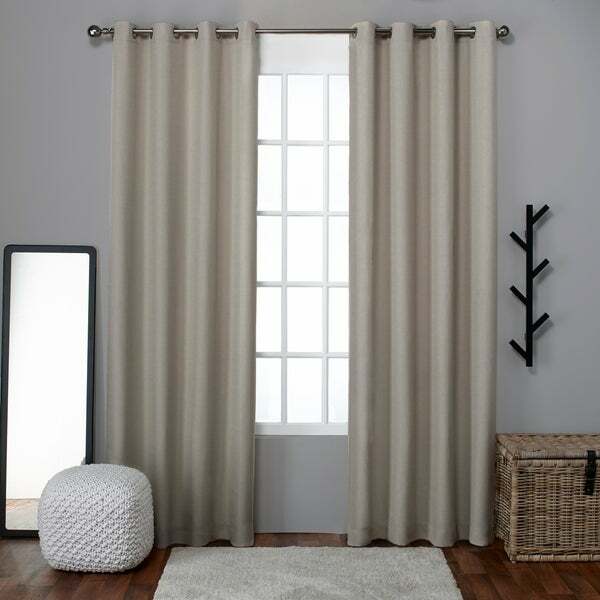 Update your modern day decor with these lovely linen window panels, availble in many affordable colors. 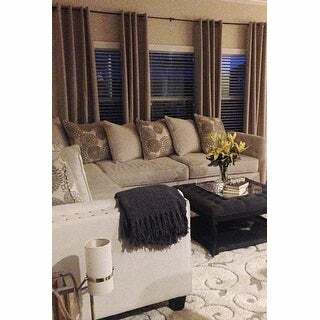 Each panel is crafted from a rich, linen-like fabric with a soft woven construction and hangs from 8 matte silver grommets that will fit a curtain rod up to 1 5/8 inches. The set is available in your choice of black pearl, natural, winter white, peacoat blue, or blue teal color options. Please note: Some options listed or pictured may be currently out of stock. All in-stock options are listed near the Add to Cart button.The digital images we display have the most accurate color possible. However, due to differences in computer monitors, we cannot be responsible for variations in color between the actual product and your screen. Dimensions 96.0 In. X 54.0 In. X 0.2 In. 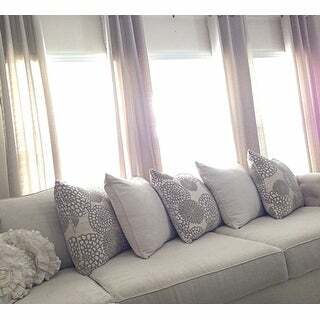 I really love these linen curtains! I was having a really hard time finding curtains for my living that worked until I purchased these. As soon as i put them up I knew that they were perfect. The light linen is exactly what I needed. I ordered 6 panels and a few of them did have some snags but not noticeable enough for my to go through the trouble of returning them. For the price you really can't go wrong. I do wish there weren't any snags, but they are still beautiful and light. I still need to lift the bar but as you can see in the pictures they are really pretty. At this price, it's almost impossible to find drapes that will hang so beautifully right out of the packaging. I thought I was going to have to pull out the old steamer, but that was not the case with these! I love them and they are so classy. I've had several compliments on them and I'm purchasing some for my sisters new home very soon. I've been searching for 108" linen curtain panels for months. All I was finding in the color I wanted was from Pottery Barn, and I was not about to spend ****+ per panel. When I came across these curtains, I decided to give them a try. For $** for the pair I really didn't have anything to lose. I just hung them today and they are perfect. They have a very slight sheen to them, but not something that bothers me. Ran an iron over them quickly, and any creases came right out. Gorgeous and nice quality for an amazing price. These curtains actually do look like linen though they are a 100% polyester which is more durable and resistant to the grubby fingerprints of our 10 year old and his friends. They are hand washable- and do need a quick iron as the wrinkles don’t just come out on their own. The dove grey color is subtle and matches sage green walls, looks good with stainless silver appliances in adjacent kitchen. The grometsbare large, sturdy, and slide well on the rods. The curtains are indeed light filtering, as in the morning you can see the trees, landscaping and swing set through them, and light comes through. From outside at night you can see shapes and people inside - like looking through opaque glass. So, perhaps not ideal for a bedroom. The only drawback (hence 4 and not 5 stars) is the inconsistent hem line. One pair was 2 inches shorter, another one inch shorter, than the longest set. Overall, still a nice purchase. The panels were 2 different lengths. 2 inches off from each other. Nice curtains, sub par packaging. Would buy again. The Winter White is a very bright pure white. The fabric looks and feels nice. They are 96" from the center of the grommet and hang very nicely. They are machine washable, that is a great bonus as they are pure white. I have black out blinds for night, however during the day I like to let plenty of light in while still providing privacy. 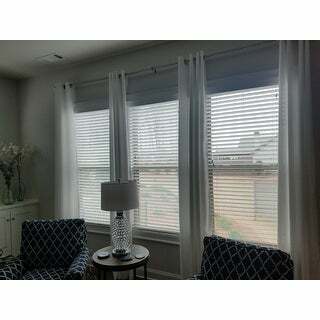 These curtain panels serve that need perfectly, if you want to block light this is not the product for you. My only complaint is that the tops of the panels where not covered in plastic and put into a bare cardboard box for shipping. The tops of the panels where lightly soiled. Spot cleaned with a damp towel and all was well. They are pure white and the window is open a lot so washing will happen. 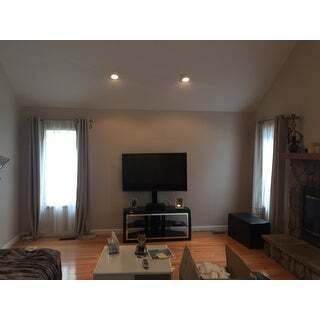 As some other reviews have stated, these curtains seem to let just the right amount of light in. We have them in several rooms in our house. You cannot see into our house through the curtains. During the day, they allow enough light in without making the room dark. In my opinion, they're best for maintaining privacy while allowing light to filter in. I love these curtains. 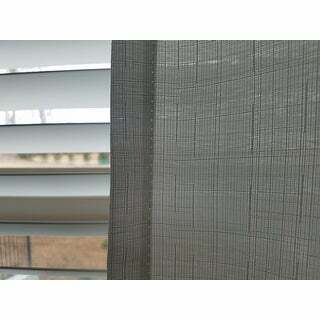 The linen texture is great and just what I was looking for on my sliding glass door. However, I returned them because I purchased the natural color and they were too dark for my room. The natural color is close to a basic burlap color. I couldn't figure out if the beige was lighter or darker than this color, so opted for something different. However, if you can find the color you want, I think you will love the curtains. I looked around for 108 inch white curtains for a long time and was so happy to finally find these. They didn't break the bank and look very nice hung! They do let some light in and aren't totally opaque but that is the look I was going for. Love them! Love these curtains. I got 6 panels and they are all the same length. I appreciated the longer length options available and how affordable they are. These curtains were unexpectedly nice, especially at such a low price point. We were very pleased, and I would definitely buy again. Nice light curtains. Glad they come in pairs! These curtains are a good product for the money. Not perfect, but look good. We ordered these drapes for our downstairs dining and living rooms. They are great, the neutral color works well with everything. My only compliant as several people mention is they are poorly packaged - so some arrived dirty. There was also a slight pull in one of them. Putting drapes in a full plastic wrap isn't that hard, they should look into it. Just what I was looking for. Well made, they hang nicely, touch up with iron and they're ready to hang. 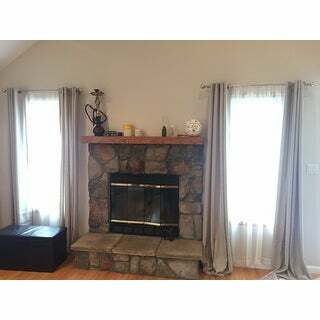 I love these curtains and have them hanging in the family room, adjacent eat-in kitchen dining and the dining room. They look crisp and dressy. They are light filtering and only shadows can be seen through. It was a little difficult to iron out the wrinkles from packaging. If I put the iron on any higher, I'm afraid I might have scorched them, so I bought a steamer that worked great. I know I'll use the steamer on clothes when needed, so for me that was OK.
After buying two 63" pairs for my bedroom, I came back and bought the 84" for my living room. They are pretty but unobtrusive, and they do a great job of cutting down the heat and sunlight. These curtains are NOT LINEN as stated. They are polyester. Very cheap looking. Mine had flaws in the material as well. Sent back immediately. Customer service is awesome as usual but I don’t want to order things I have to return. Waste of time..
Love these curtains! You can’t beat it for the price! It has a “linen” texture to it, which is what I was looking for for my dining room. I am very happy with my purchase. Beautiful color and high quality material. Subtle texturing and perfect medium light filtering, love it! Just wish it came in a longer length. "Are these curtains see through at night?" I paired my curtains with blackout pull down shades as they are in my guest bedrooms. I believe they would be fairly see through at night and are more decorative panels. I love them in my bedrooms, great quality. 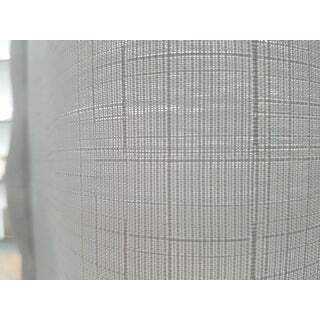 These are light filtering curtains, they are not blackout/privacy curtains nor are they described to be. "What is the color on picture #62 and what is the color on picture #66? I like both of those but cannot tell what color they are?" "What aare that bother colors and what are the length and are they in pairs?" These are sold in a sset of two panels. The colors and sizes are listed on site. I hope it helps. "What color is backside of panels?" 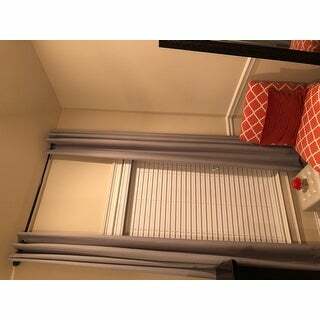 Please refer to images on site that show the bottom back corner of the curtain. "My window is 122 wide how many sets would give me a nice full and not stretched out look?" We recommend 2-3 times the rod width for proper look and fullness. 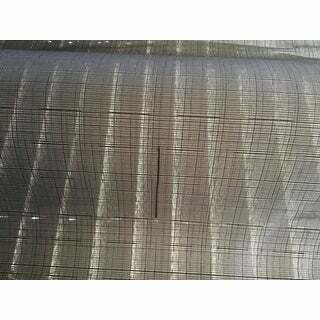 "The Black Pearl in the panel photo is like a gray but the fabric swatches show a solid black...is solid black available in the 96 inch length?" We do not offer a solid black in this set. The black pearl is a grey/charcoal color, just like a real black pearl. "Do you receive two panels 54 inch wide "Each" in one package?" Yes, this includes two panels and they are each 54 inches wide.